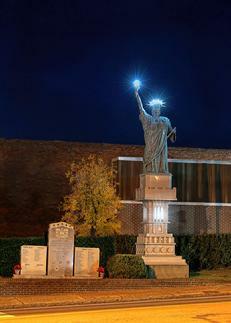 Located at the intersection of Hwy 341 and Hwy 441 in downtown McRae-Helena is Liberty Square, home of a Statue of Liberty replica that is 35 feet tall and one-twelfth the original's actual size. She is constructed of a stump from a nearby swamp, styrofoam and an electrician lineman's glove. Also in Liberty Square is their version of the Liberty Bell and a marble memorial to Telfair County residents who died in service.